With the release of the next generation of the iPhone coming, you can easily expect the sheer number of rumors, speculations and analysis from different websites. Now, it seems the latest of which is a leak that shows what seems to be an iPhone 6SE, not an iPhone 7, with a Geekbench score that is higher than what the recent iPhone 6S scored. With that said, is Apple changing its pace of naming its products? Or is this just an elaborate hoax made by a Photoshop expert? The source comes from a persona in China that claims to have acquired a prototype for the next generation of iPhone. Of course, the seemingly sane thing to do was to run a couple of benchmark test procedures and show it to the world, which he did. Although details are somewhat sparse, we are given a glimpse of the handset’s operating system, the model, and the Geekbench score. First off, the purported prototype’s single-core score is at 3,042 and the multi-core score is 5,210. 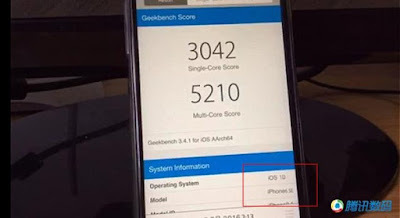 For reference, the iPhone 6s managed to score 2,542 and 4,427 in GSMArena’s Geekbench benchmark test respectively. This would likely mean that the iPhone 6SE will have the new A10 chip that will bring performance upgrades to the next iPhone. Apple will reportedly launch the next iPhone on September 7th, so it will only be a few days until everything about it goes official. Still, while this holds some validity to it, it’s best to wait for the official announcement.